Larry Gannon’s futile attempt to cash in on thoroughbred James Patrick? Larry was entranced by the horse because coincidentally it had the same name as member Billy O’Shea’s son. Gene Dooley and Mike Foster conspired to get Larry Gannon drenched as he finished up on No. 9, turning on the sprinklers? A gang of Happy Valley members traveled to Montreal as guests of “Valley Grad” and Montreal Canadian star Larry Pleau to watch the Habs play the Bruins? John Ferguson scored the winning goal and Pleau got said puck as a souvenir for special guest Larry Gannon? The Atlantic Restaurant in Marblehead was a favorite hangout for Valley members? Gannon’s pro-am partners left him stranded in the Green Meadow GC parking lot in Hudson, New Hampshire? Larry Gannon played a hoax on eight members, claiming the Valley was hosting a blind golfers tournament the next day and needed them on the course at 5 a.m. to serve as caddies? Bill Harney birdied the fifth hole, but tragically died two holes later from a heart attack, and when Bobby Lyman birdied the same fifth hole a few groups later, after the round claimed the individual “ding” for No. 5 because Bill, God bless him, had not completed the round? Larry Gannon had claw hands, the result of arthritis, but turned the negative into a positive by designing an ideal golf grip from said condition? Larry Gannon, after cheering on the Pleau-led Canadians to victory over the Bruins, was left high and dry – we mean wet – when, stepping out of a Montreal hotel room shower, co-conspirators O’Shea and John McManus Sr., hid the towels, tied his underwear in knots and hung them out the window? Paul Barkhouse, while Gannon’s assistant pro, would grab a player’s driver on the first tee, look at it, then suddenly whack a ball (“let me try this,” he’d say), and hammer the tee shot through No. 1 fairway, through No. 5 fairway, and the ball would and on the second fairway? Gannon’s daily ritual included going home daily from 1 to 3 pan to enjoy two pieces of chocolate, a glass of orange juice, a nap, and return to his club duties by 3 p.m.? Larry was a neat freak? Larry went to 6 a.m. mass on Sundays? Larry told the applicable caddies that they must attend 6 a.m. mass on Sunday if they wanted a ride to the club and a big (or two) that day. The day Bruins’ stars Gerry Cheevers, Eddie Johnston and Bobby Orr came by to play a round at the Valley with Sammy Videtta? The day Orr played in the Paul Canvanaugh Memorial and signed a ton of photographs depicting his famous Stanley Cup – winning goal in 1970? Nancy Lopez’ father, Domingo, stopped by for a round with Gannon – before his daughter became a star golfer? 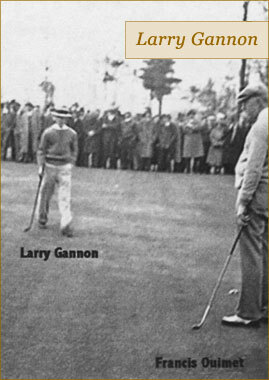 The first Larry Gannon Member – Guest in 1977? Mike Foster started his work day at 4 a.m. for a double-shotgun event and ended up getting one hour of sleep before starting the next workday? Foster running the annual Junior golfer’s trip (bus and tournament tickets were free) to Pleasant Valley to watch the touring pros? The year one of Foster’s junior tried taking home 500 practice balls from the Pleasant Valley range, but eventually returned them all to the PV pro shop? Buddy Kalapinski threw his putter in the pond on the 18 during his first round of the season, then later in the season, unbeknownst to him, brought the same putter from the pro shop after Foster had it retrieved and cleaned. The year Mayor Al DiVirgilio struck the ceremonial season opening tee shot and struck Item photographer Walter Hoey in the jewels? Gary Conn’s group from Flynnie’s Bar in Marblehead did a lot more during their annual outing than play golf? Joe Naples would be kidded that if he stood up straight with his bowlegs, he’d be 6 feet 2 inches and not 5 feet 7 inches? Bob Gorman’s famous nocturnal activities with his hollow leg? Gorman became famous for his ability to shoot 75 after a night of partying? The Happy Valley crowd hung out at the Blue Moon? The Valley’s all-star foursome of Kalapinski, Tom O’Toole, Tommy Gaffey and Bob Gorman would enjoy a spirited night of socializing in Miami, then find a pool hall and play for hours still wearing their golf spikes? Foster was put in the shower, sitting on a chair, with his clothes on, for therapeutic purposes? Mike Ostrowski, hitting from the left rough on No. 5, thought he’d stuck a rock at impact but in fact had unearthed a 1935-dated 50-cent piece, most likely dropped by a construction worker helping build the course?